Greenpeace wants to call a time-out on “fast fashion.” In a report published on the eve of Black Friday, the post-Thanksgiving sales extravaganza that serves as the unofficial start of the holiday-shopping season, the environmental nonprofit revealed new research about the environmental consequences of compulsive overspending, particularly when it comes to trumped-up “bargains” designed to trigger a false sense of urgency over items we don’t need. Needless to say, clothing is one of the quickest-moving products. “Because it is so cheap, fast fashion is one of the highest selling product categories on Black Friday, with many major fashion brands and retail giants jumping on the bandwagon,” wrote Kirsten Brodde, head of Greenpeace’s Detox My Fashion campaign, in a blog post. Indeed, fast fashion has not only fundamentally changed the way we dress, but it has also reshaped how we think about clothes and what we do with them, according to Time-Out for Fast Fashion. 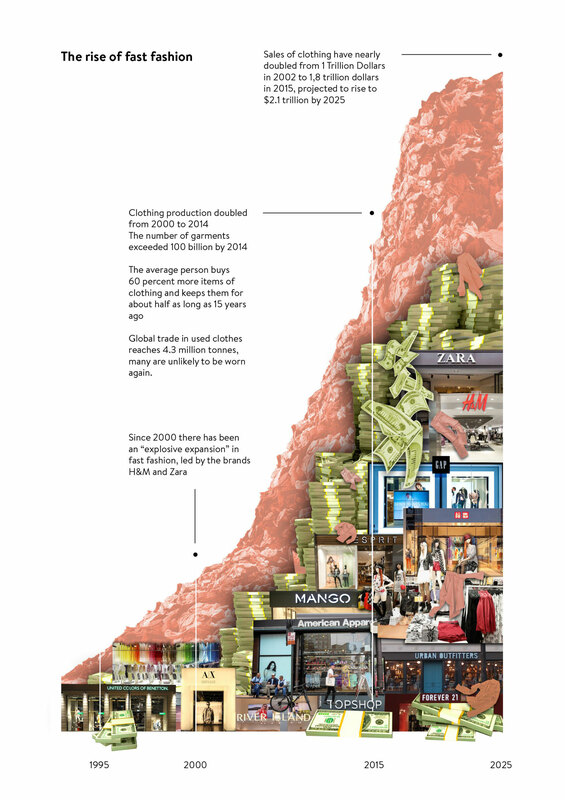 Garment production has doubled from 2000 to 2014, with sales rising from $1 trillion in 2002 to $1.8 trillion in 2015. By 2025, that figure is projected to soar to $2.1 trillion. Garment production has doubled from 2000 to 2014, with sales rising from $1 trillion in 2002 to $1.8 trillion in 2015. For an industry that is already one of the planet’s biggest polluters, the outlook gets even more grim. The purchase and use of clothing generates over 850 million tons of carbon dioxide—or about 3 percent of global carbon-dioxide emissions—every year, Greenpeace said. Polyester, already present in 60 percent of clothes, emits nearly three times as much carbon dioxide in its life cycle than cotton. Besides taking decades to degrade, it and other synthetics are also contributing to the proliferation of microplastics in our oceans. And although we’re buying about 60 percent more items of clothing every year, we’re also keeping them for about half as long as we did, say, 15 years ago. What that translates to is a colossal amount of landfill waste. Because of the skyrocketing volumes of cheap, disposable garments, the secondhand-clothing system is “on the brink of collapse,” Brodde said. Valiant attempts at “closed-loop” recycling aside, current solutions fall short of technical and commercial viability. “This means that, as the situation stands today, every garment we buy will eventually end up as waste, to be burned in incinerators, or dumped in a landfill,” Brodde added. If our appetite for cheaper clothing continues, any gains from Greenpeace’s own attempts to eliminate hazardous chemicals from the fashion supply chain will be negated by increased rates of production and consumption. The only surefire solution? Buy less. Greenpeace wants to call a time-out on "fast fashion." In a report published on the eve of Black Friday, the post-Thanksgiving sales extravaganza that serves as the unofficial start of the holiday-shopping season, the environmental nonprofit revealed new research about the environmental consequences of compulsive overspending, particularly when it comes to trumped-up "bargains" designed to trigger a false sense of urgency over items we don't need. Needless to say, clothing is one of the quickest-moving products. "Because it is so cheap, fast fashion is one of the highest selling product categories on Black Friday, with many major fashion brands and retail giants jumping on the bandwagon," wrote Kirsten Brodde, head of Greenpeace�s Detox My Fashion campaign, in a blog post.